Ken Cuccinelli insists that Terry McAuliffe is the pro-shutdown candidate for wanting to expand Medicaid. 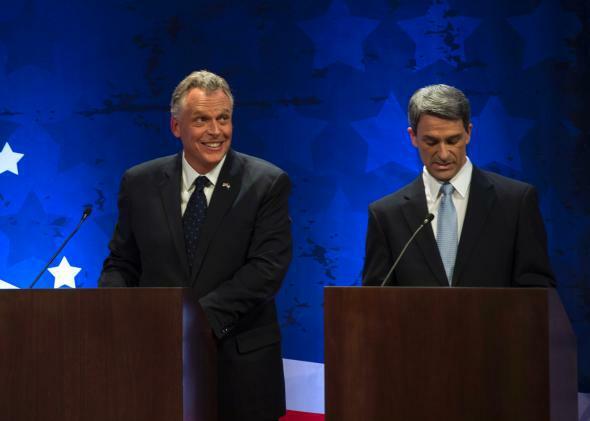 The moment at last week’s Virginia gubernatorial debate that really sent eyebrows raising came when Ken Cuccinelli was asked about Ted Cruz’s filibuster (of sorts) of the continuing resolution to fund the government. He was baited by his Democratic rival, Terry McAuliffe, who bellowed that “gridlock, driven by the Tea Party, is once again risking a government shutdown that would be devastating to the Virginia economy.” (Democrats are pretty confident that the Tea Party is now a loser for Republicans. Cuccinelli may have been the movement’s first winning candidate – his victory at the 2009 Virginia GOP convention was celebrated by activists waving Gadsden flags.) Most media coverage focused on Cuccinelli’s tongue-tied difficulty to distance himsef from Cruz. More interesting: Cuccinelli’s insistence that McAuliffe was actually the shutdown candidate. It’s clear he’s very committed to the Medicaid expansion. I understand that. But it is not the be all and end all of Virginia budgets, particularly if you’re willing to shut down Virginia government just to get the Medicaid expansion, which he said repeatedly he won’t sign a budget without Medicaid expansion in it. Now I disagree with him on Medicaid expansion. But this is not an appropriate tactic for Virginia. This is a Washington tactic. And if you like the way Washington works, you will like a Governor McAuliffe. If you don’t think Washington works right, if you think it’s dysfunctional, as I do, then I’m your candidate in this race. With his self-professed commitment to shut down Virginia government unless ObamaCare’s Medicaid expansion scheme is enacted, Terry McAuliffe reminds us again that he is a member of the Washington establishment. And, he will readily employ the tactics that have become commonplace there. Just because holding our schools, public safety, and transportation system hostage have become part of the regular order of business in Washington doesn’t mean the tactic should be replicated in Richmond. For months now, Terry McAuliffe has been telling anyone who will listen that he’s willing to shutdown Virginia’s government unless the General Assembly goes along with his budget-busting plan to expand Medicaid. The threat is huge: do what I want, or your schools don’t open on time. Your transportation projects shut down. Now his campaign is trying to to walk it back, noting that on occasion Terry McAuliffe will say ‘please.’ Saying ‘please’ doesn’t make that much difference when you’re holding someone at gunpoint. It’s my favorite example of the transmogrification of shutdown politics, and of how Republicans now work so hard to promise that they would never force a shutdown for ideological reasons because hey don’t look over there at Congress!